Mary Stevenson Cassatt was born on May 23, 1844 in Allegheny, Pennsylvania, near Pittsburgh, to Katherine Kelso Johnston and Robert Simpson Cassatt. She was the youngest daughter of five siblings. The Cassatts were landed Pennsylvanian gentry who lived comfortably off of their father’s successful brokerage career. When she was seven, the family moved to Paris and then on to Germany. In 1855, the youngest Cassatt, Robbie, died from bone cancer, which prompted the family to move back to the United States and settle in Philadelphia. After five years of an expressed interest in art, Mary Cassatt, at the age of 16, was ultimately granted permission by her parents to attend the Pennsylvania Academy of Fine Art (PAFA). During Cassatt’s day, both men and women were allowed to view art galleries and copy works of art side by side, which previously was prohibited. Therefore, her parents had to be somewhat liberal in their thoughts to permit their youngest daughter to pursue an interest in art making. During her years at PAFA, Cassatt was surrounded by a group of talented students which included the painter Thomas Eakins, sculptor Howard Roberts and the engraver Emily Sartain. After years of pleading with her father to allow her to travel to Europe, Cassatt and her mother arrived in Paris for the Christmas season of 1865. At that time in Europe, the young artist was able to witness the advancements of the international art world first hand. Already showing promise as an artist, Cassatt was taken on as a private student by the most famous French Academy painter of the day, Jean-Léon Gérôme. Soon after her arrival, Cassatt grew tired of the Parisian art world, which to her, was centered on self-image, flattery and prejudice. Eventually, she traveled to the French countryside and joined her American friend, Eliza Haldeman, to study under genre painter Charles Chaplin and history painter Thomas Couture. By 1867, both Cassatt and Haldeman were traveling the French countryside and making sketches from nature. In 1868, their works were accepted into the Paris Salon. By 1870, the outbreak of the Franco-Prussian war forced Cassatt to leave France and return to Philadelphia. This would be her last visit to the United States for the next 20 years. Struggling to gain success in the American art world, Cassatt yearned for the cultural opportunities available in Europe. The expatriate promptly returned to Europe and toured Italy and Spain in order to study the works of the Old Masters. Having been rejected by the Paris Salon of 1875, she accepted Edgar Degas’ invitation to join the Impressionist group. Already familiar with Degas and an admirer of his work, Cassatt had her first exhibition with the Impressionists in 1879. This would be the beginning of a lifelong friendship of over 40 years between Cassatt and Degas. The details of their relationship have never fully been revealed. Close to the end of her life, Cassatt burned many of their letters to one another, further creating a mystery. In 1877, her family moved to Paris to live closer to their daughter. The supportive relationship of the Cassatt family is in large part the inspiration for her famed mother and child pictures, which would bring her international success in the following years. It is around this time that she also displayed an interest in Japanese woodblock prints. She would later use similar techniques to create her own exquisite prints frequently referring to the mother and child theme. By 1884, Cassatt purchased a chateau, Mesnil-Beaufresne, in the French countryside, which would become her retreat from the bustling Parisian art world in the later years of her life. Similar to the fate of her fellow Impressionist, Claude Monet, Cassatt’s eyesight deteriorated, as she grew older. In 1914, she was diagnosed as having cataracts in both eyes. After several failed surgeries, she went blind. For a woman who relied so much on her own independence and as an artist who relied on studies from nature, the loss of her eyesight was a devastating blow. She died on June 14, 1926 at her chateau. In the five years following her death, memorial exhibitions were held in both France and the United States. Transgressing restrictions of a women’s place in society, Cassatt is heralded today as one of the most important Impressionist artists of the 19th century. She is difficult to place into a specific national school as she is vied over by both American and French cultures. To the dismay of many art historians, Cassatt burned the majority of her early paintings in 1906. Her enrollment in the Antique Class at the PAFA suggests that she was a proficient draftsman. However, the limited availability of local models and works by the Old Masters proved Philadelphia to be an unfruitful environment for the young artist. She yearned for the challenges and adventures Europe had to offer. Unwilling to submit to the gender boundaries of society, Cassatt pleaded with her father to allow her to travel to Europe. For several years her father appeared to reject her request, even reportedly stating that he “would almost rather see you [his daughter] dead” than have her become an artist in Paris. Travel to Europe elicited parental fears for their daughter’s moral reputation. Ultimately, the compassionate nature of Robert Cassatt allowed him to change his decision, permitting his youngest daughter to travel to Europe, but only if she went with her mother and several friends of the family. Once in Europe, Cassatt was known to have spent hours copying the works of the Old Masters, most importantly those of Correggio and Parmigianino. In one of her earliest surviving works from 1872 titled Bacchante, the Romantic depiction of the female figure is heightened by rich, vibrant golds and greens typical of Renaissance artists. Although Cassatt studied under Gérôme, she never likened her painterly approach to the rigid, Neo-classical style of the French Academy. Instead, she admired the work of the French genre painters Edouard Frère and Paul Soyer. Studying under each of these artists at one point in her career, she learned to use nature and local villagers as models for her paintings. Though landscape scenes were integral to both genre painting and French Impressionism, Cassatt never excelled in this arena. She was much more intrigued by the human form, especially the female figure, rather than the effects of light that the Impressionists so enthusiastically studied. In the years of her friendship with the Impressionists, especially Degas, Cassatt became interested in depicting the modern woman of the Parisian bourgeoisie. A key work of this period is her painting Woman with a Pearl Necklace in a Loge of 1879. While painted in delicate brushstrokes of pastel pigments typical of the style of Renoir and Degas, the painting is also a comment on the vanity of late 19th century Parisian society. A feminist reading of Cassatt’s work should not be overlooked. In her later years, she contributed works to an exhibition in New York that benefited the Suffragist movement. At the turn of the century, Cassatt was surrounded by the decadence and chauvinism of 19th-century Paris. Known to have purposefully chosen everyday, unattractive models and then dressed them in expensive gowns from local fashion boutiques, Cassatt created in her paintings a dichotomy between what Griselda Pollock would later argue to be “ugliness and beauty.” To further add to this concept, Cassatt painted her finely attired, “ugly” models in exquisite, airy pastels. Layered with conceptual meaning, these works, nevertheless, capture the intimate moments between the artist and the influential, strong women in her life. Aside from her paintings, Cassatt also was a pioneering printmaker in the Western world. Like many of the French Impressionists, she had an affinity for Japanese woodblock prints and owned works by the 18th century Japanese artist, Utamaro. Interestingly, many of Cassatt’s prints of mother and child strongly resemble Utamaro’s series of the same subject matter. Although she never was to receive critical acclaim from American audiences during her lifetime, Cassatt helped to shape America’s early art collections. In 1874, she began a lifelong friendship with Louisine Elder, who later married Henry O. Havemeyer. With the guidance of Cassatt, the couple created one of the most prestigious collections of art in American history. The Havemeyer collection has since been donated to the Metropolitan Museum of Art in New York and the majority of the museum’s Impressionist works, which include several works by Cassatt, come from this collection. 1. Adelson, Warren. 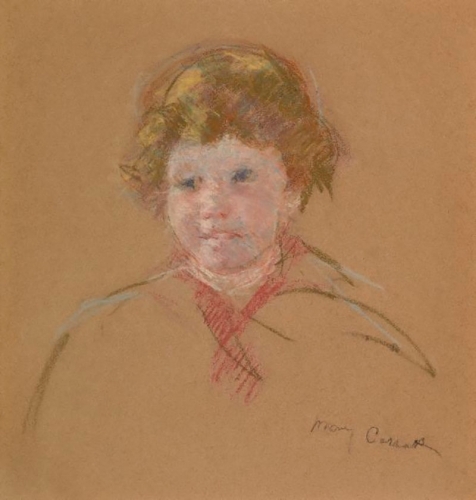 Mary Cassatt: An American Observer. New York: Coe Kerr Gallery, 1984. 2. Clement, Russell T., et al. The Women Impressionists: A Sourcebook. Westport, CT: Greenwood Press, 2000. 3. Craze, Sophia. Mary Cassatt. North Dighton, MA: World Publications Group, 2003. 4. Hale, Nancy. Mary Cassatt: A Biography of the Great American Painter. Garden City, NY: Doubleday and Company, Inc., 1975. 5. Mathews, Nancy Mowll. Mary Cassatt. New York: Harry N. Abrams, 1987. 6. Mathews, Nancy Mowll. Mary Cassatt: A Life. New York: Villard Books, 1994. 7. Mathews, Nancy Mowll ed. Cassatt and Her Circle: Selected Letters. New York: Abbeville Press, 1984. 8. Mathews, Nancy Mowll ed. Cassatt: A Retrospective. New York: Hugh Lauter Levin Associates Inc., 1996. 9. Pollock, Griselda. Mary Cassatt: Painter of Modern Women. New York: Thames and Hudson, 1998. 10. Roudebush, Jay. Mary Cassatt. New York: Crown Publishers. Inc., 1979. 11. Sweet, Frederick A. Miss Mary Cassatt. Oklahoma: University of Oklahoma Press, 1966. 1970, 1978, 1989-90 National Gallery of Art, Washington, D.C.
1966 Smithsonian Institution, Washington, D.C.